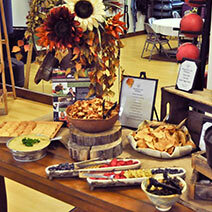 We strive to provide new, fun and effective programs and events throughout the year. Our list of events is always growing! 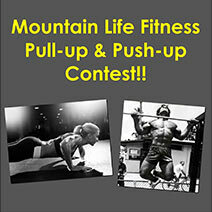 Below, please find many of the contests and unique programs that you can expect as a Mountain Life Fitness member. This Saturday, April 21st, from 1-3PM at MLF in the group exercise room, we are hosting the “Funds for Finch Zumbathon Fundraiser”—suggested donation is $20.00, but any amount is welcome and appreciated. This benefit is specifically to help raise funds for our wonderful member LaNita Finch who has been left with significant medical bills due to the recent, sudden catastrophic illness and subsequent passing of her husband, Jim. Zumba dancing will be instructed by licensed Zumba instructors, Jodi, Montana, Suzi and LaNita. We have drawings for prizes as well as an amazing silent auction. And, so many of you have been incredibly generous donating items for the silent auction including two, half-hour massages with Jane at Ala Mode, two rounds of golf, assorted gift baskets from The Stalk Market, prints from Real Snowflake Photography, handmade items from local artisans, restaurant certificates, two 3-hour clean certificates from Cabin Works and 1-8 visit pass to Hot Sulphur Springs as well as our donation of two, 1-hour personal training sessions! However, if you would prefer to make a monetary donation, all checks should be made payable directly to LaNita Finch. *This event is open to the public. If you are bringing someone along, please note they will need to complete visitor paperwork including all instructors who are not members of MLF. Workshops are each 30 minutes long, and are open to the public! Saturday, September 23rd, joins us from 10AM-12PM for our first annual Fitness Fair! This event is open to the public and will include the following COMPLIMENTARY demonstrations. 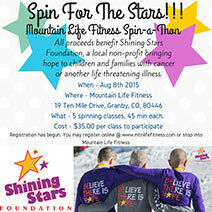 our 3rd annual “Spin-a-Thon” for the Shining Stars Foundation is scheduled for Saturday, August 19th. 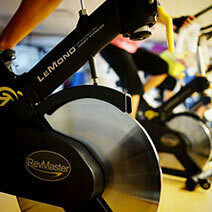 You may attend one or both of the 45-minute indoor group cycling classes, one at 8:15 and one at 9:15AM. Each class is $35.00 all of which is donated to the Shining Stars Foundation. If you are unable to attend, you may donate as well. Please cash or checks only made out directly to Shining Stars Foundation as we collect and then give the funds directly to Shining Stars. Registration has begun here at MLF. Please stop by the reception desk and sign up today! *This event is open to the general public, so bring a friend a long! All new riders will require a bike fit, so please note the bike fit sign-up sheet as well at the reception desk. We will contact you for a fit so you are all set for this important event. 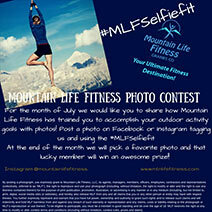 If you have any questions, please direct those to me at jackie@mtnlifefitness.com program right here at MLF! This is an 8-week program which guides, coaches and trains the rider from a one hour ride to a two hour ride in the final two weeks. Many riders register for this program as they are preparing for events such as the Ride of the Rockies or the Iron Horse Classic. However, we certainly have had riders that simply wanted to take on this challenge and prepare for their spring/summer/fall outdoor rides. Registration for this program will begin the first of March. This is a fee-based 8-week session program. The cost of the 8-weeks is $80.00 (a steal!). You will be able to register for the specific rides that you are available for; however, you will need to pay upfront in full for those rides. This is an amazing, cutting edge program right here at MLF! A fun and thorough program for ages 7-18 that teaches proper lifting techniques, safe and effective use of exercise equipment, proper sprinting form and proper running form. An awesome prize for the best member photo that shows how Mountain Life Fitness training has helped you accomplish your outdoor activity goals. 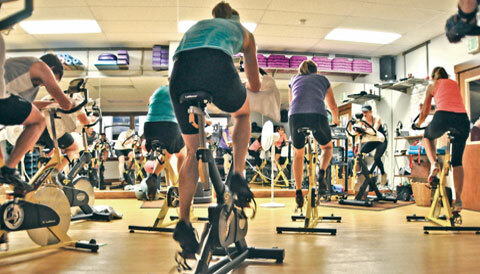 A day-long Spin-a-Thon benefiting the Shining Stars Foundation. Members and non members are invited to join as many spinning classes as they dare to raise much needed funds for this wonderful organization. 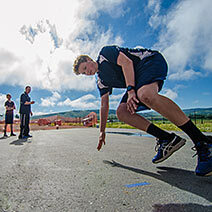 When the weather is nice, we take our popular boot camp program outside. 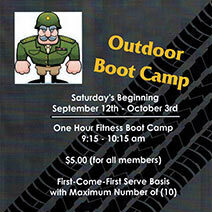 Join us for fresh air, beautiful scenery and a workout you will love! Bring your A-game and pit yourself against your felow members to become the pull-up or push-up club champion. Prizes for the winners and benefits for everyone who trains for this program. 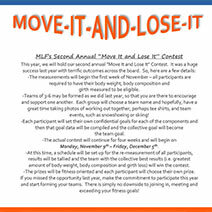 A fun-filled team competition that motivates members to maximize their workouts and optimize weight loss. Meeting and exceeding fitness goals while sharing the process with your teammates and working towards a common goal. This is the perfect program to prepare you for ski season. Expertly designed to strenthen and stretch the key muscle groups you use most on the slopes. Be ready for opening day by joining this intense program. 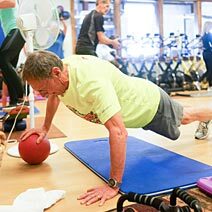 Mountain Life Fitness is proud to offer a special Membership to Healthways participants under their external Medicare Plan. This type of Membership does not include a charge or monthly payments directly at MLF, but rather specific formatted reporting will be tracked and then administered by Jackie Wright for MLF to be compensated by Healthways via direct deposit. Please contact us for more details about Silver Sneakers. Multiple times throughout each year, we celebrate our members with receptions or parties to introduce new and healthy fare and give an opportunity to mingle with fellow members. Our receptions are casual affairs designed for our members who are in the club working out that day, to enjoy a light, healthy snack post workout! The perfect indoor program to beat the winter blues and prepare you for the months ahead. This high-energy program is structured to provide tremendous fitness and cycling benefits to all levels of fitness.